Can be used indoor/outdoor. 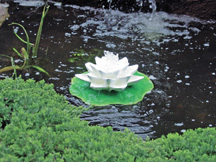 Adds the sound of moving water to any pond. Durable, lightweight polyresin. Accepts 1/2" or 3/8" tubing. Pump included.